The Fair” as we know it has been held every September since 1894 when the Carleton County Agricultural Society moved its fair from Bells Corners to its present site in Richmond. Agricultural fairs were not new to the village but records before this time are incomplete. We do know that as many as four fairs a year were held, often on the government lands on the east side of Cockburn St. at the corner of Strachan St. There are newspaper reports of the buying and selling of livestock and crops being accompanied by heavy drinking and fighting. 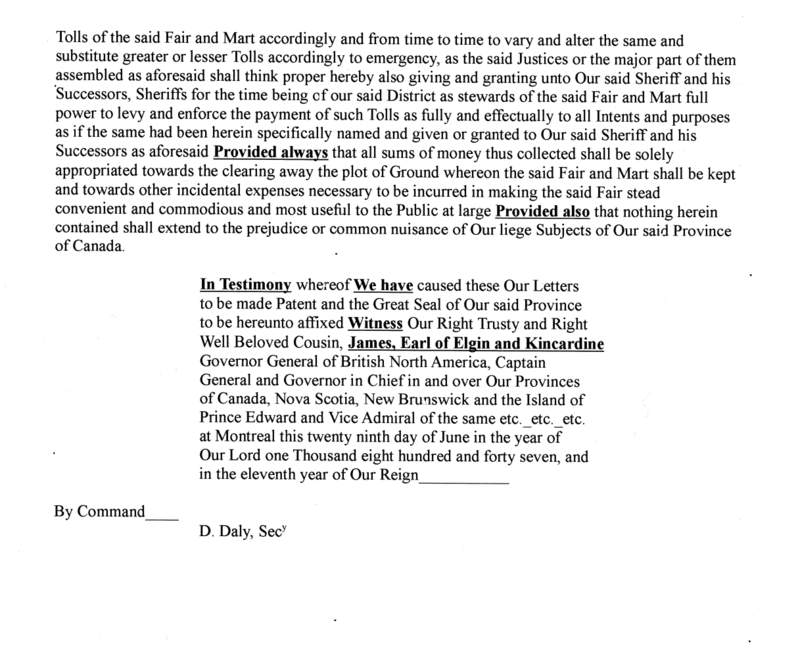 The Government of Canada tried to regulate the fair by granting Letters Patent to the local sheriff. 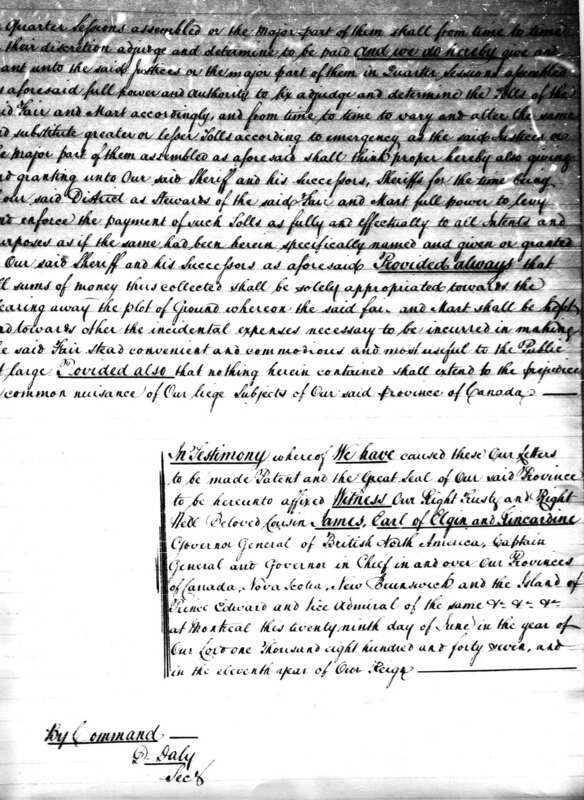 George Neville has transcribed these Letters Patent and provides us with a short introduction, his transcription, and a copy of the original document. 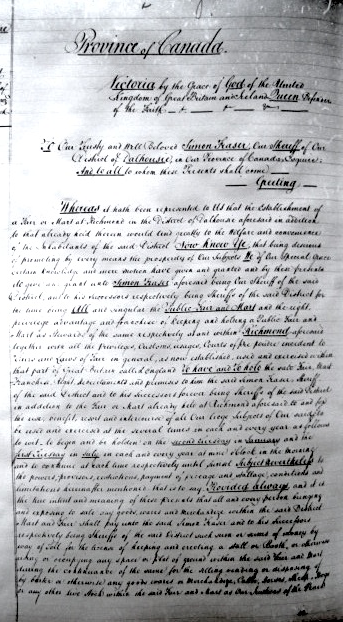 On the 29th day of June 1847, Letters Patent were issued to Simon Fraser, Sheriff of the District of Dalhousie, by the Province of Canada, witnessed and sealed by James, Earl of Elgin and Kincardine, Governor General of British North America, Captain General and Governor in Chief in and over Our Provinces of Canada, Nova Scotia, New Brunswick and the Island of Prince Edward, etc., etc., etc., to hold two Fairs in each year at Richmond. These Fairs were to be held yearly beginning on the second Tuesday in January and the first Tuesday in July at nine o’clock in the morning and to continue until sunset. The purpose of such Fairs is for selling, bartering or otherwise any goods, wares or merchandize, Cattle, Horses, Sheep, Hogs, or any other livestock, subject to Tolls for transactions. Proceeds from the Tolls shall be solely appropriated towards the clearing away the plot of Ground whereon the said Fair and Mart shall be kept and towards other incidental expenses necessary to be incurred in making the said Fair stead convenient and commodious and most useful to the Public at large. 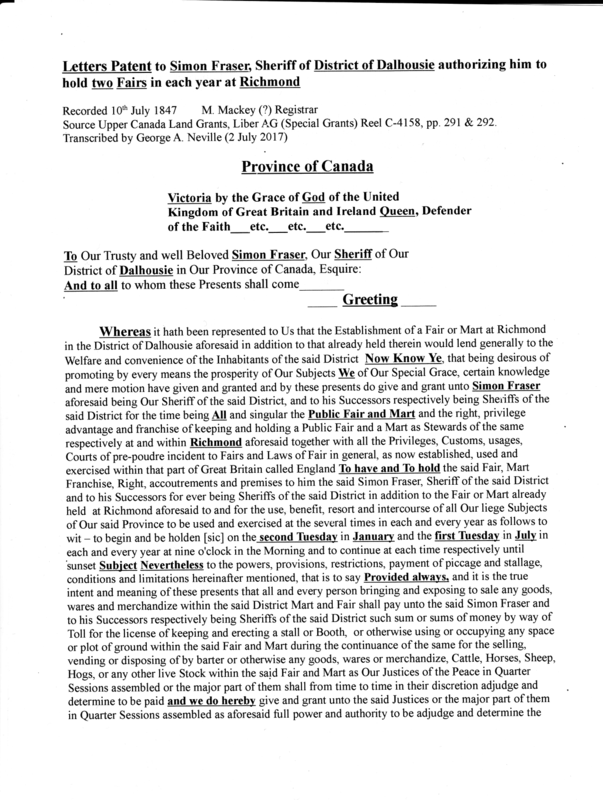 This entry was posted in document, Events and tagged Agricultural Society, law & order, social activities. Bookmark the permalink.